Sarah Kimball Potter was born on July 29, 1661 in Ipswich, Essex County, Massachusetts. Her parents were John Kimball and Mary Bradstreet. She married John Potter. John was born about 1652 in Ipswich. His parents were Anthony and Elizabeth Potter. According to Cutter, his mother was Elizabeth Whipple and according to Stone his mother was Elizabeth Stone. When they married they received a gift of land valued at £30 from her father. Aaron Potter (1699, married Sarah Appleton). John died September 9, 1718. He was buried in the "Old Yard" at Ipswich. Sarah died in 1724. Sarah Kimball, born July 29, 1661; died in 1724; md. John Potter,of Ipswich; first child, Sarah Potter, born Dec. 11, 1685.
whereas our honored father John Kimball Ips. late dec'd. did upon the marriage of our sister Sarah, unto John Potter Ips. give as part of her portion a parcel of land valued at £30 which said land sd Potter enjoyed till sd parents dec. and sd parent not having given a deed we the sd Benj and Jos. do convey according to his will &c.
Thos. Potter, Nathl Knowlton, to wit. Anthony Potter, the immigrant ancestor, was born in England in 1628, died in 1690. He settled in Ipswich, Massachusetts, where he is first recorded in 1648..... Mr. Potter owned a farm, one of the best in town, on the road to Salem, about a mile southwest of Ipswich village, and extending north to Ipswich river. He was successful in the raising of fruit. He and his wife gave a silver cup to the Ipswich Church. Anthony Potter married Elizabeth Whipple, born 1629, died 1712, daughter of Deacon John and Sarah Whipple. Elizabeth [Stone], bapt. 6 Mar. 1628/9; came to New England in 1635 with her parents; m. about 1652, Anthony Potter of Ipswich, Mass., b. in England about 1627 (a stepson of Elder John Whipple of Ipswich, Mass. 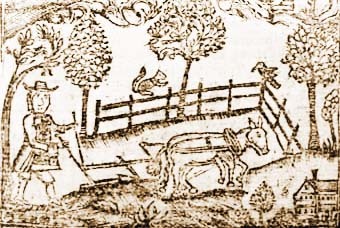 ), d. in Ipswich in 1689/90. She d. at Ipswich 10 Mar. 1712, aged 83 years, according to her gravestone. 1. John, b. abt. 1653. 2. Edmund, b. abt. 1655. 3. Samuel, b. abt. 1657. 4 Elizabeth, b. abt. 1659, m. abt. 1681, Thomas Kimball. 5. Lydia, b. abt. 1661, m. abt. 1683, Jonathan Putnam. 6. Thomas, b. abt. 1664. 7. Anthony, b. abt. 1667. To be presented to the court meant to be charged or indited.